Raman spectroscopy is a spectroscopic technique that detects photons that have undergone Raman scattering. Since Raman scattering is relatively weak compared to Rayleigh scattering, one of the main historical problems with Raman spectroscopy had been separating out the weak Raman signal from the strong Rayleigh signal. Today, this problem is easily remedied with notch or edgepass filters. Similarly, recording the Raman spectrum has been aided greatly by the advent of CCD spectrometers. The image below shows a Raman Spectrometer system constructed using Thorlabs components designed for 780 nm light, including a retired TLK-780M Tunable Laser Kit fed into a retired Tapered Amplifier. In this side-scattering configuration, the polarization of the laser was set vertically with respect to the table (horizontally polarized light cannot scatter horizontally). Isopropyl alcohol, contained in a cuvette and mounted in a CVH100 Cuvette Holder, was used as a sample. The cuvette holder allowed optical access to all four sides of the cuvette, making it ideal for a Raman spectrometer. The scattered light was collected by a fiber and fed into Thorlabs' CCS200 spectrometer. The Raman spectra for isopropyl alcohol, measured with this 780 nm Raman spectrometer, is presented to the lower right. A Raman spectrometer constructed from Thorlabs components. 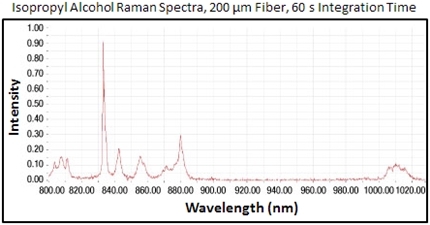 Raman spectrum for isopropyl alcohol, measured with the 780 nm Raman spectrometer discussed above. Power is important in Raman measurements. Raman scattering is a weak, low-probability event with a 1/λ4 wavelength-dependent efficiency. Sensitivity and integration time for data accumulation improve with increasing power, as long as the notch or edgepass filter can sufficiently attenuate the strong Rayleigh signal and the power is below the damage/saturation thresholds of the devices. 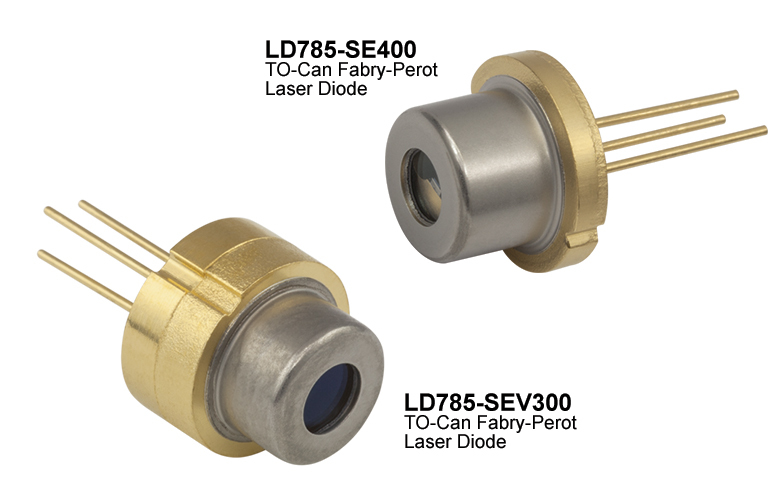 To address this need, Thorlabs offers several laser diode packages for 785 nm that have output powers on the order of several hundred milliwatts, such as the LD785-SE400 or LD785-SEV300, capable of delivering 400 mW and 300 mW of power, respectively. When using a laser to produce Raman scattering in a sample, sufficient power is important to improve the sensitivity and integration time of measurements. Thorlabs has invested in developing our GaAs material design and processing capabilities in order to produce reliable devices while improving the output power and available wavelengths. A selection of Thorlabs' laser sources useful for Raman spectroscopy is outlined below. Our line of GaAs-based gain chips and diode lasers offers the possibility to improve the signal quality of an instrument by dropping in a higher power replacement or to design a new instrument around a customized diode. Traditionally, many Raman spectrometers have been built around 785 nm chips. 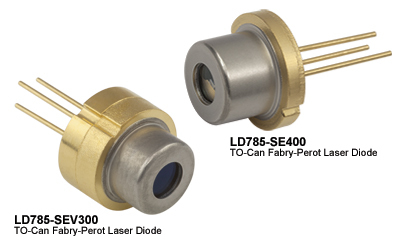 Thorlabs offers two Ø9 mm TO can laser diodes at 785 nm, with one diode providing 400 mW of power (LD785-SE400), and the other, a wavelength-stabilized laser diode, providing 300 mW of power (LD785-SEV300). For some applications, other wavelengths may be desired to balance the 1/λ4 Raman signal dependence with the background fluorescence of a particular sample. The GaAs material system can be designed to produce wavelengths from 630 nm up to about 1050 nm. In these cases, Thorlabs' OEM manufacturing capabilities may be able to develop a solution to suit a particular application. Please contact Sales-TQE@thorlabs.com for more information or to discuss an application. The Raman spectroscopy experiment described above was constructed using components from Thorlabs' extensive line of optomechanical components, optic mounts, and optics. The setup was built on a breadboard using our SM1 lens tube and 30 mm cage systems. Components were mounted using our Ø1/2" and Ø1" post assemblies and bases. Alternatively, our extensive line of optical rails provides another option for building a support structure for your experiment. In addition to our standard line of optic mounts, Polaris™ low-drift kinematic mirror mounts are available for mounting optics in the system that require long-term alignment stability, particularly in conditions where the temperature may cycle in between experimental runs. Thorlabs offers a wide range of mirrors which can be used to guide light through the system. Besides our plano broadband-dielectric- and metallic-coated mirrors, we also offer concave and off-axis parabolic mirrors that can be used to focus or collimate light within the system without introducing chromatic aberration. Raman scattering produces a relatively weak signal compared to optical signals produced by other mechanisms, such Rayleigh scattering or fluorescence from the sample. Filters that can remove unwanted signals are an important part of a Raman spectroscopy system. Thorlabs' line of premium hard-coated edgepass filters and bandpass filters provide a solution. Our line includes longpass filters with cutoff wavelengths between 400 nm and 1500 nm and bandpass filters with center wavelengths between 400 nm and 1064 nm. Fiber patch cables can be a convenient way to simplify light introduction or collection in Raman spectroscopy applications. They are available with a variety of fiber core sizes, connector types, and cable lengths. If you cannot find a patch cable suitable for your application, you can design your own custom patch cable using our custom cable configurator. Back reflections from the optics in a setup can re-enter the cavity of a laser, potentially causing mode-hopping, amplitude modulation, frequency shifts, or even damage to the laser source. Optical isolators are passive magneto-optic devices that only allow light to travel in one direction, protecting the laser source from back reflections or other signals that may occur in the system after the isolator. 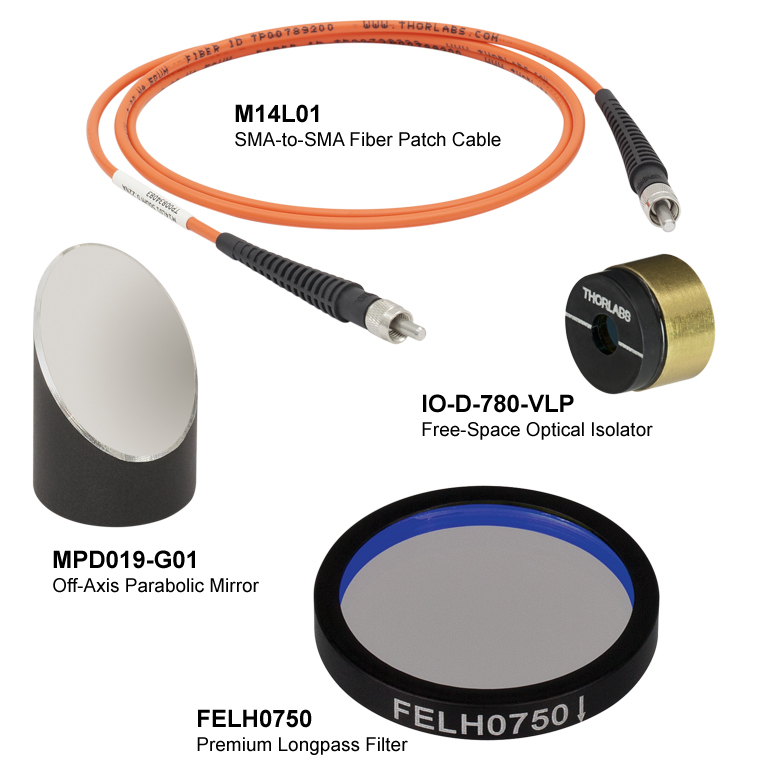 Thorlabs' optical isolators are available in fiber coupled and free-space configurations with center wavelengths ranging from the UV to the IR. While our most popular isolators are shipped from stock to provide faster service, custom isolators are also available. Visit the Custom Isolator page for more information or to request a quote. 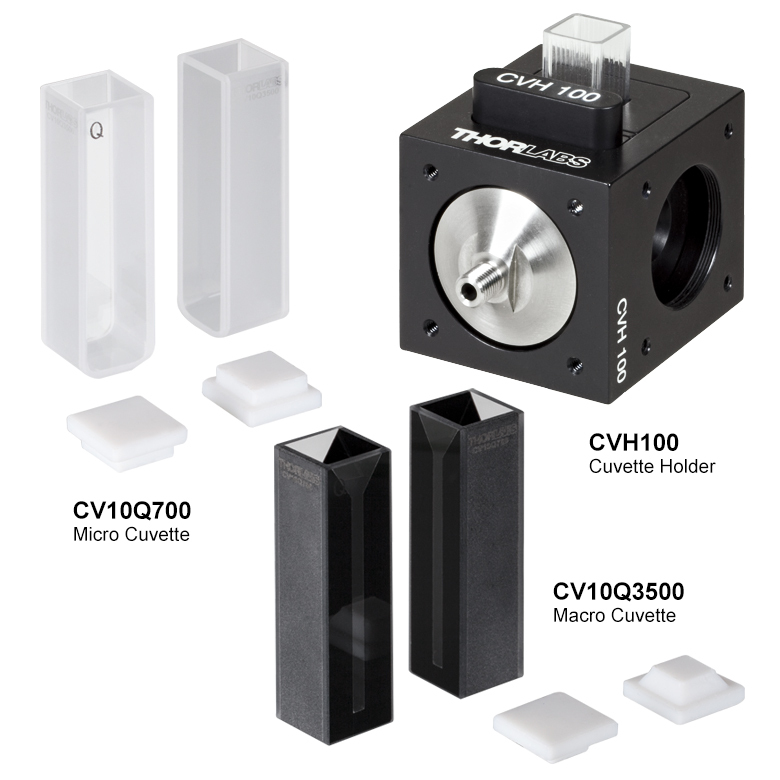 Thorlabs' CVH100 cuvette holder was used to integrate sample solutions into the Raman spectrometer described above. The holder can be used with both macro and micro cuvettes and features four light ports. A filter can be added via a filter holder that fits into a slot on the top of the CVH100. The cuvette holder also comes with a fiber adapter that includes a collimating lens, allowing output light to be fiber coupled into a detector. 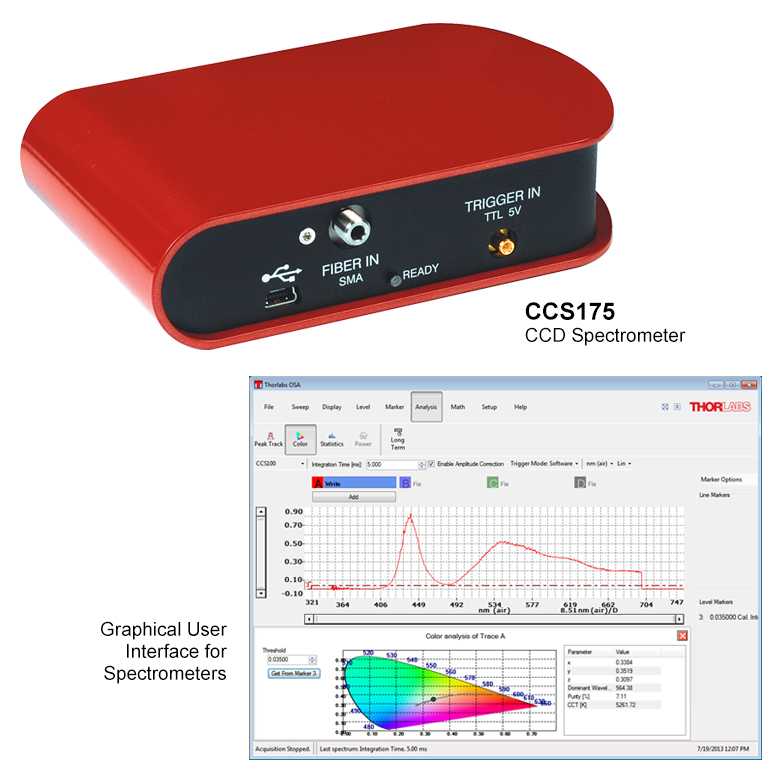 Thorlabs offers a line of CCD spectrometers that can be used to record the spectrum produced by a Raman spectroscopy setup. These compact spectrometers feature an SMA connectorized input and come with an SMA-to-SMA connectorized fiber patch cable. Each spectrometer is wavelength and amplitude calibrated. The spectrometers are controlled via a software package that includes a graphical user interface and extensive set of drivers for data acquisition and analysis. Discovered by Krishna and Raman in 1928, Raman spectroscopy has given rise to a multitude of specific techniques, from Linear Raman Spectroscopy to Coherent Anti-Stokes Raman Spectroscopy, and proven itself to be a powerful tool for spectroscopic analysis. One of the most common applications of Raman spectroscopy is to measure vibrational, rotational, and other low-frequency modes of a system (e.g., molecules). In molecules, photons (from a laser) undergo Raman scattering from the molecules. This is a form of inelastic scattering in which the final energy state, Ef, is different from the initial energy state, Ei. This type of scattering is in contrast to Rayleigh scattering, which is an elastic scattering event in which the final and initial energy states are the same. Both Rayleigh and Raman scattering are dependent upon the polarizability of a molecule: the stronger the polarizability of a molecule, the larger the scattering cross section. While both Rayleigh and Raman scattering are second order processes that scale as 1/λ4, the scattering rate for Rayleigh scattering is on the order of 103 times greater than that for Raman scattering . Typically in Raman spectroscopy, the stronger Rayleigh signal must be extricated since it carries little pertinent information on vibrational modes. Since Raman spectroscopy requires that the polarizability change as a function of normal coordinate, one of its limitations is that it cannot measure direct dipole transitions. Because of this, Raman spectroscopy is sometimes utilized with other techniques to fully measure the vibrational and rotational states of a molecule. For example, in the CO2 molecule, of the three vibrational states depicted in the figure to the right, only ν1 (symmetric stretching) is Raman active. The other two vibrational states (bending and anti-symmetric streching) are infrared active ; thus Raman and infrared spectroscopy comprise complementary measurements. 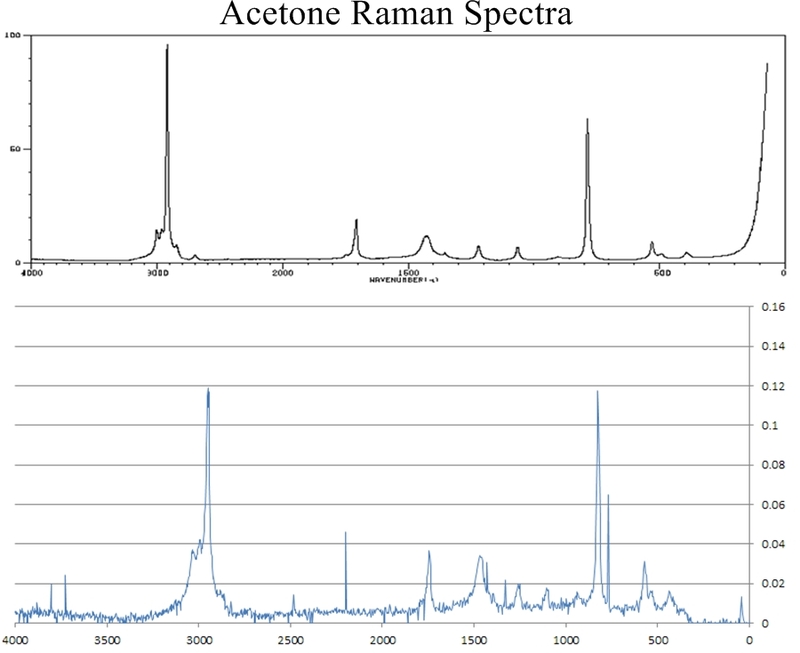 Raman spectrum for Acetone, measured with a 532 nm Raman Spectrometer (bottom), and compared to published results (top). Raman scattering is a two-photon process where the incident photon (hνi) is absorbed by the molecule, and the molecule is excited to a "virtual" level (not necessarily a stationary Eigenstate). Once promoted to this virtual level, the molecule will decay to an excited state and emit a "scattered" photon (hνs). In general, the molecule begins in the ground state, and thus, the energy of the scattered photon is less than that of the incident photon. The energy difference is related to the vibrational, rotational, or electronic energy of the molecule . The emission of a scattered photon possessing less energy than the incident photon is called Stokes radiation, whereas the emission of a scattered photon possessing more energy than the incident photon is known as anti-Stokes radiation. The figure to the left depicts Stokes and anti-Stokes radiation. Since anti-Stokes radiation requires that the molecule already be in the excited state before scattering, the peak intensity of the anti-Stokes signal is lower than of the Stokes signal. 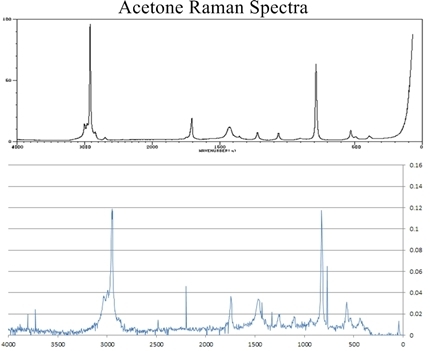 The graphs to the right show the results of a typical Raman spectrum for acetone taken with Thorlabs' DJ532-40 laser diode compared to published results. For standard linear Raman spectroscopy, information about the molecule is obtained through several measurements. The linewidth of the scattered radiation can yield a plethora of diverse information about the system. For example, in a gas sample, the linewidth can represent Doppler width, collisional broadening, natural linewidth, etc. Polarization analysis of the Raman spectrum also yields additional information about anisotropy and the polarizability tensor. Additionally, information about molecular orientation or vibrational symmetry can be extracted from polarization analysis. Finally, the intensity of the Raman lines relates to the scattering cross section and population density of molecules in the initial state. Discovered by Krishna and Raman in 1928, Raman spectroscopy has given rise to a multitude of specific techniques, from Linear Raman Spectroscopy to Coherent Anti-Stokes Raman Spectroscopy, and proves itself to be a powerful tool for spectroscopic analysis. One of the most common applications of Raman spectroscopy is to measure vibrational, rotational, and other low-frequency modes of a system (e.g., molecules). Raman scattering by molecules is a type of inelastic scattering, in which the final and initial energy states are different, resulting in the molecules being in a different quantum state. Raman scattering is in contrast to Rayleigh scattering, an elastic scattering event, in which the final and initial energy states are the same (i.e., energy is conserved), and the molecules remain in the same quantum state. Both Rayleigh and Raman scattering are dependent upon the polarizability of a molecule: the stronger the polarizability of a molecule, the larger the scattering cross section. While both Rayleigh and Raman scattering are second order processes that scale as 1/λ4, the scattering rate for Rayleigh scattering is on the order of 103 times greater than that for Raman scattering . Typically, in Raman spectroscopy, the stronger Rayleigh signal must be extricated since it carries little pertinent information about the vibrational modes. Since Raman spectroscopy requires the polarizability change to be a function of normal coordinates, one of its limitations is that it cannot measure direct dipole transitions. Because of this, Raman spectroscopy is sometimes utilized with other techniques to fully measure the vibrational and rotational states of a molecule. For example, in the CO2 molecule, of the three vibrational states depicted in the figure to the right, only ν1 (symmetric stretching) is Raman active. The other two vibrational states (bending and anti-symmetric stretching) are infrared active ; thus, Raman and infrared spectroscopy comprise complementary measurements. Raman scattering is a two-photon process, wherein the incident photon (hνi) is absorbed by the molecule, and the molecule is excited to a "virtual" level (not necessarily a stationary Eigenstate). Once promoted to this virtual level, the molecule will decay to an excited state and emit a "scattered" photon (hνs). In general, the molecule begins in the ground state, and thus, the energy of the scattered photon is less than that of the incident photon. The energy difference is related to the vibrational, rotational, or electronic energy of the molecule . The emission of a scattered photon possessing less energy than the incident photon is called Stokes radiation, whereas the emission of a scattered photon possessing more energy than the incident photon is known as anti-Stokes radiation. The figure to the left depicts Stokes and anti-Stokes radiation. Since anti-Stokes radiation requires that the molecule already be in the excited state before scattering, the peak intensity of the anti-Stokes signal is lower than peak intensity of the Stokes signal. The graphs to the right show the results of a typical Raman spectrum for acetone, taken with Thorlabs' DJ532-40 laser diode, compared to published results. For standard linear Raman spectroscopy, information about the molecule is obtained through several measurements. The linewidth of the scattered radiation can yield a plethora of diverse information about the system. For example, in a gas sample, the linewidth can represent Doppler width, collisional broadening, natural linewidth, etc. Polarization analysis of the Raman spectrum also yields additional information about anisotropy and the polarizability tensor. Additionally, information about molecular orientation or vibrational symmetry can be extracted from polarization analysis. Finally, the intensity of the Raman lines relates to the scattering cross section and population density of molecules in the initial state. Dear Sir, I'm a researcher from Missouri University of Science and Technology and I'm interested in UV Raman spectrometer. Could you please send me quotations? Thank you! Kind regards, Sergii. Hello, thank you for contacting Thorlabs. I will reach out to you to discuss your application and a quote. Is there any manual to find out which one of your products should be choose to assemble a raman spectroscopy system? Hello, thank you for contacting Thorlabs. I will reach out to you directly about your application and its requirements. We are an academic research team at Tennessee Tech, and we are interested in purchasing Raman spectrometers at various excitation wavelengths including 785nm, 532nm and UV excitation ranges. Could you please send us their quotations via e-mail. Thank you! Hello, thank you for contacting Thorlabs. While we don't have preconfigured systems, I will reach out to you with some details on setups we have put together in the past.